I had a bunch of things piling up that I have been wanting to share with you, so I decided to compile everything into one big shout-out blog post. Enjoy! I have been tweaking my blog template and have made some small but good changes. I updated my ceramic blog links. It’s now connected to my blog reader so it will be automatically synced and up to date from now on. Just head on over to the right side of the blog to check out all the great links. I have changed and added the categories on the side of the blog too. This way you check out all the How-to’s & Tutorials in one place or all the posts about Soda Firing in one place too. Hopefully this will make it easier for folks to search the archives (they’re pretty big!). The Salt/Soda Firing discussion group/ social network is really taking off. If you’re interested in salt and soda, I highly suggest that you join this group! There are some great potters that have joined (including my friend Gary Jackson who finally has images of his work up online). I’m excited about the sharing that happening (slip and glaze recipes for soda!!) and for it to continue to evolve and grow. My friend Machiko Munakata is an amazing ceramic sculptor who has taken her talents into a new direction. 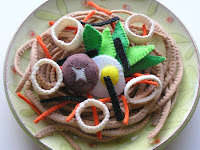 She’s making these amazing felt foods, like this yummy plate of yakisoba to the left. You can find all of her creations on her Etsy site. The plate that her creations are displayed on is from Kristin Pavelka. Machiko has been my biggest cheerleader for me to join Etsy. I’ve taken one step closer and set up my page. There’s nothing for sale yet, but that’s to come next week (after taxes!). Update: Machiko’s work was featured on Boing Boing today. Lindsey Holmes, a potteryblog.com fan, told me about what looks like a great show. Lindsey works for Hedge Gallery in San Fransisco. The gallery has an exhibition of Welsh potter, Paul Philp’s work that will be on display through mid-May. Thanks for the tip! Cattle Barn Clay Co. is a new clay company that was started by fellow Earlham grads Billy Cooper and Li Hunt-Cooper. It’s located in Royal Center, IN (sort of between Indianapolis and Chicago). They specialize in raw materials and new and used refractories. And their prices are really great. Kiln shelves that are up to 50% off retail prices. Check it out! Each of these True Fans will spend, on average, $100 per year on your work. You end up with $100,000 gross annual income. After all the expenses (taxes, insurance, materials, show fees, etc…), you end up with a solid living. 1000 fans probably seems like an overwhelming number. But if you look at as 1 person per day for 3 years, that’s a little easier. Or maybe you have 500 True Fans that spend $200 per year. And it’s possible that you aren’t selling directly to that group. You can have super loyal fans that are buying your work through galleries and shops. I hope you take some time to read the article. Kelly goes into quite some depth and looks at different scenarios and ways to gain True Fans. What are your thoughts?